Celcom Axiata Berhad together with renowned celebrities delivered the new iPhone 6s and iPhone 6sPlus, the most advanced iPhones ever, by teaming it with its personalised FIRST plans and exclusive promotions that are powered by its 4GLTE lightning speed network, with a memorable experience right at the doorstep of Celcom customers during the midnight iPhone launch last Thursday. 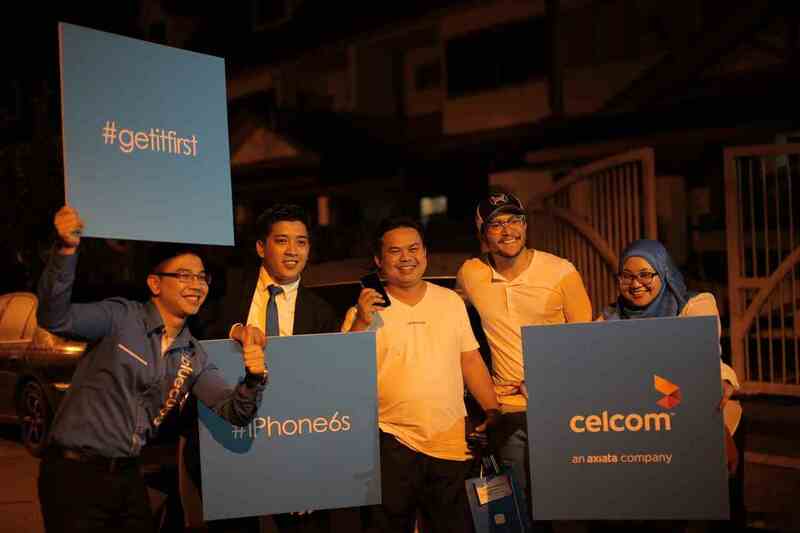 A selection of Celcom FIRST customers living around Klang Valley and who had pre-ordered the new iPhones via Celcom from 9 October to 14 October, were chosen to experience the exclusivity for a privileged personalized special delivery of their new mobile phones by local celebrities. They were amused, delighted and speechless with joy, when local celebrities Amber Chia, Scha Al-Yahya, Winnie Soo, Jack Lim, Shaheizy Sam, Ella Aminuddin, Yasmin Hani, and Sha’arin Mohammed Razali Wong and Awal Ashaari visited them at their homes. Earlier, the celebrities were flagged off by Zalman Aefendy Zainal Abidin, Chief Marketing and Sales Officer, Celcom Axiata Bhd and Tuan Syed Md Najib Syed Md Noor, Chief Customer Service and Retail Officer of Celcom Axiata Bhd at 11pm, during the midnight iPhone launch from the Blue Cube@Sunway Pyramid. Teh Ooi Keat, one of the many lucky Celcom customers who pre-ordered said he was surprised to receive his new iPhone6sPlus from Soo Wincci during the early hours of Friday morning. “When I was first told a celebrity was going to deliver my phone, I totally did not expect Soo Wincci to be the one delivering it to my doorstep.” Teh who has been a Celcom customer for almost a year said he never expected to experience such a special visit when he first signed up. Another lucky Celcom customer, Rozali Ahmad, said he was surprised to have Shaheizy Sam deliver the phone to him at 2am. “I was actually anticipating someone like Neelofa to deliver the phone to me, but Shaheizy was equally as surprising and awesome,” he said. Zalman said the iPhone midnight launch was a success as many Celcom customers were exclusively greeted with a privileged experience that would be remembered. He said that Celcom was more excited than ever to be to heighten customer experiences when their devices were powered and personalised by the country’s strongest network – Celcom’s lightning-fast and widest 4G LTE network. “We are thrilled and glad for every one of our privileged customers to have an exclusive experienced, whether it be at our BlueCube@Sunway Pyramid or with our local celebrities bringing the phones right to their doorstep,” he said. Meanwhile, six lucky customers, the first three walk-in and three pre-order customers who arrived and waited during the midnight launch at BlueCube@Sunway Pyramid walked away with their brand new iPhones for only RM6.50. Walk-in customers Shawn Low, 25, and Jesseca Chow, 23, who are friends, arrived at Celcom’s BlueCube@Sunway Pyramid 33hours before the midnight launch on Thursday. Low said he wanted to experience the long queue that he has read about during most iPhone launches in other countries. “It came as a shock because I did not expect to win something this big. I was only looking forward to receive my new phone and cherish the experience of queueing up for more than 30 hours,” Low said. “I really did not expect to receive a gift of purchasing my phone for only RM6.50. I am really happy and am glad that my patience paid off with good virtue,” Chow said. Zalman said this personalised and exclusive give-away is something extraordinary that every Celcom customer can continue to expect. He said these expectations are in-line with Celcom’s FiRST brand promise which is to bring exclusive privileges and the best customer experience. Those who pre-ordered and awaiting for the Samsung Galaxy S5, April 11th is the date you should save! iPad mini with retina display and iPad Air available in Apple Store Malaysia.